Auvray’s storming win in the Group 3 $350,000 Harrolds Sky High Stakes (2000m) at Rosehill today has seen him shorten dramatically in the betting for the 2018 Sydney Cup. 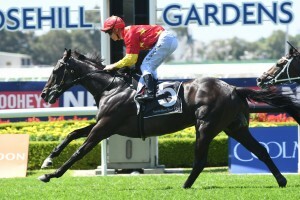 Auvray, above, storms into Sydney Cup calculations with win in Sky High Stakes at Rosehill. Photo by Steve Hart. The Richard Freedman trained Auvray has firmed into $13 from $51 for the Group 1 $2m Schweppes Sydney Cup (3200m) at Randwick on April 14 following his powerhouse finish from back in the field. Winning jockey Glyn Schofield settled Auvray ($9) midfield before bring him down the middle of the course in the straight to beat the $3.40 favourite Libran with Mackintosh ($7) also coming from the second half of the field to finish third. Auvray’s win wrapped up an early winning double for Schofield who took out the first race on Coolmore Classic Race Day on Multifacets for trainer Chris Waller. Schofeild is set to start a two weeks careless riding suspension at the completion of today’s meeting and was very happy to get two early wins on the board. “I have a long stretch on the side after today,” Schofield said.